Benefits: Though it is closely related to the Opium Poppy it has a very different effect on the central nervous system. It is not a narcotic. Rather than disorientating the user, it tends to normalize psychological function. It’s gently antispasmodic, sedative and analgesic effects make it a valuable herb for treating physical and psychological problems in children and adults. It has been shown to be beneficial for children to overcome bed wetting, difficulty in sleeping, nervous tension and anxiety. Where ever antispasmodic action is required it can be used. Can be taken to relieve headaches, migraine, neuralgia, back pain, arthritic pain, sciatica and the pain of shingles. It can be used internally and externally. Externally it can be applied to areas of local pain, such as toothache. Though its calming actin is in the nervous system, it can also influence the heart and circulation. It has been shown to slow down a rapid heartbeat and relieves palpitations and helps to lower high blood pressure. 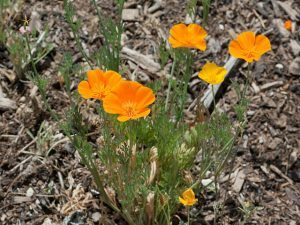 Californian Poppy is a gentle balancer to the emotions and a calming remedy during times of stress. It is valuable in the treatment of addiction withdrawal whether it be alcohol, drugs, pharmaceutical drugs or tobacco. Traditionally it is used in the treatment of colic pains and in the treatment of gallbladder colic. Active Constituents: Alklaoids similar to Opium Poppy including protopine, cryptopine and chelidonine. Also, flavone glycosides. Pharmacological Actions: Sedative, hypnotic, antispasmodic and reduces pain and irritation similar to an analgesic.